Good nutrition is an essential component of pregnancy. Even when you try to eat your healthiest, it can be hard to maintain the right balance of vitamins and minerals for both you and baby. Your body must function at its best while the little one grows inside of you, and it can be hard to perfect on your own. Luckily there are many ways to keep yourself and baby in great shape, with today’s modern technology. Prenatal vitamins have been around for decades, and they are now considered a staple in pregnant women’s regimens all over the globe. Before starting a prenatal vitamin, be sure to consult your physician. You may require more of one element, less of another, as everyone’s bodies are different. When you get the go-ahead from your doctor, you’ll want to start a prenatal right away. 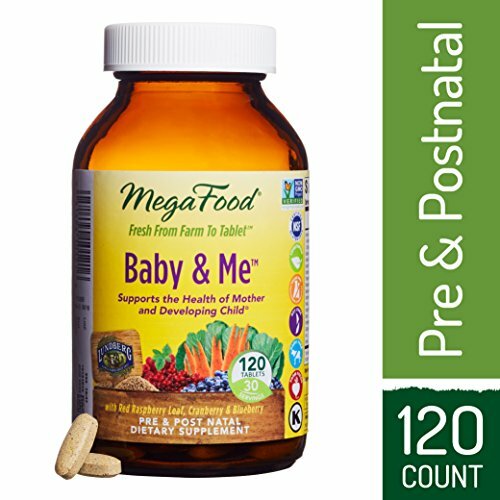 These supplements are specifically designed to give you the extra nutrients you and your baby require during pregnancy. Prenatal vitamins can be found easily, as prescriptions are generally unnecessary. And while they all strive to provide the nutrients you need, not all prenatal vitamins are created equal. So how do you choose? They can differ in type, amount of nutrients, pill type, and even certification. We’ve compiled a list of some of the best prenatal vitamins out, guaranteed to match the needs of anyone. This multivitamin is food-based; made with fruits, vegetables, and probiotics. It uses a gentle, prenatal blend that is easy to digest, and it only needs to taken once each day. 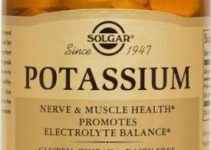 You’ll never have to worry about discomfort or constipation, because the plant-source enzymes used in this formula enhance digestion without upsetting the stomach. These enzymes and probiotics also help you maintain energy throughout the day. 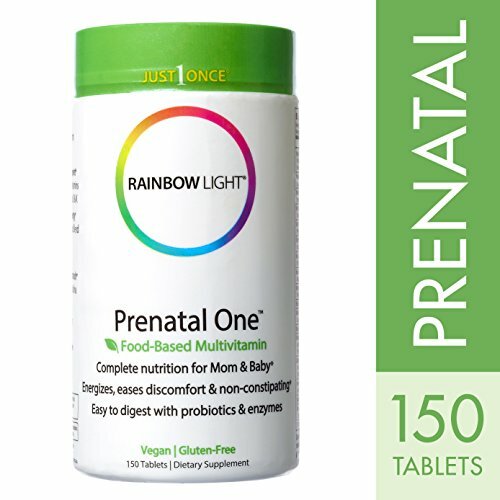 Rainbow Light’s prenatals can be purchased in 30-, 90-, 120-, or 150-day bottles, so you never have to worry about running out. 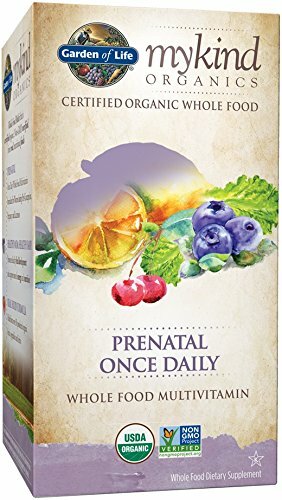 Prenatal One contains absolutely no animal ingredients, gluten, dairy/lactose, nuts, shellfish, preservatives, or additives. The supplement is ideal for vegans or vegetarians. It contains all the nutrients you need that support energy and nutrition. Each pill contains Vitamins A, B-12, C, and D2, as well as iron, calcium, and 800mcg folic acid that supports the development of baby’s brain and spine. It can be taken while trying to conceive, pregnant, or nursing to support blood, bone, skin, and immune health. The pills are standard and relatively large, so some women may find taking them a bit difficult. Health is extremely important, and if you’ve become conscious about where your food comes from, you may enjoy this product by Garden of Life. It is certified by the USDA as organic and non-GMO, so its specially-formulate blend is made from only the most nutritious and organic whole foods. It is designed for women during pre-conception, pregnancy, and breastfeeding times. It contains all the vitamins you need, as well as 18mg of iron and 600mg of folate to help support neural tube development. It also contains a whole food blend that includes ingredients like lemon peel and ginger to help fight back against nausea. It contains no fillers or synthetic binders and is completely vegan and gluten-free. You only need to take this average-sized tablet once per day. You can purchase these prenatal vitamins in 30 or 90-day supplies, so you can customize your purchase to your shopping style. The Organic Prenatal Multivitamin by Garden of Life is great for health- and environment-conscious moms-to-be who desire gentle, natural formulas. It does not contain some ingredients that standard supplements do, so speaking to your doctor about what you should be taking is essential. This Zahler product is available as 60, 120, and 180-count boxes. The boxes are full of soft-gel capsules, which you take twice daily. They should be taken with meals to avoid nausea. Each capsule is loaded with 25 ingredients, like Vitamins A, C, D, B-12, folate, iron, and calcium. And while it isn’t organic or vegan, you can find a healthy dose of folic acid, which helps prevent neural tube defects. It also contains 300mg of DHA. DHA is an important nutrient which is a critical for baby’s eye development, but also help improve cognitive function and mood in mothers. 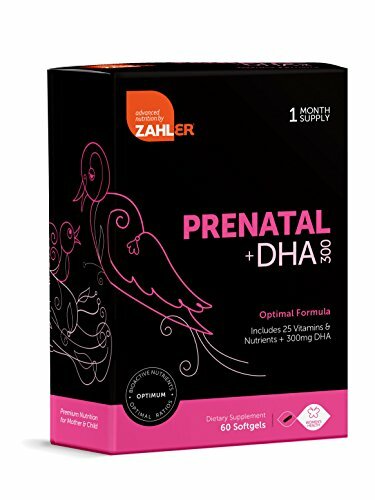 Zahler uses a third-party to test the purification of their products, so you know you are getting the “good stuff.” The formula is specially designed to provide the optimal ratio of premium nutrition for both mother and baby. These prenatal vitamins are easy-to-swallow and are designed to be gentle on the stomach. They have zero smell or aftertaste and are simple to take for even the most finicky mothers. Twice-a-day may seem like a lot but taking these gentle pills twice instead of only once can help diminish the strength it places on your digestive system, making it a good choice for mothers with sensitive bellies. Loaded with everything you need, like Vitamins A, C, D, B-12, folate and iron, you only need to take this capsule once a day. It lacks ingredients like calcium or DHA, but it contains an impressive 50mg of probiotics and 25mg of a digestive enzyme blend that uses ingredients like chamomile, ginger, and red raspberry leaf to ease nausea and digestive discomfort. It also contains methylfolate (a natural folic acid). Best Nest Wellness’ prenatal vitamins are gluten-free, vegetarian, holistic, non-GMO, dairy/lactose-free, and third-party tested. It also has no artificial colors, flavors, sugars, sweeteners, or preservatives. Since it only needs to be taken once a day, it is convenient and easy to remember. It helps naturally ease morning sickness and boost your energy and mood. While this is a great choice for women looking for natural products, you may want to consult your doctor about taking additional supplements that this formula may be missing, such as calcium. 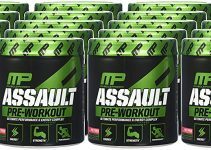 And even though they can only be purchased in a 30-day supply bottle, you can find AM/PM versions (taken twice daily) that give you the same nutrients throughout the day without the same strength. 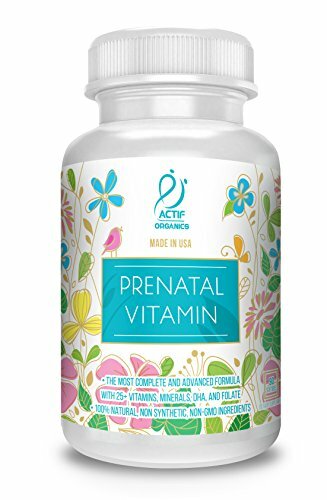 Actif only sells these prenatal vitamins in one size, but it’s an impressive 3-month supply. It boasts 100% natural, non-GMO ingredients. The gentle formula means you don’t have to eat it with food; and it only needs to be taken once daily. For best results, one soft-gel capsule should be taken with water in the morning hours. 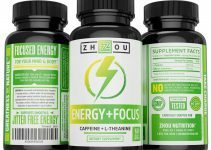 Each capsule contains more than 25 vitamins, minerals, and their own organic herbal blend that helps fight nausea and keep your digestive system on-track. This gentle blend is also completely allergen-free, so most mothers-to-be can benefit from it. You can find nutrients like Vitamins A, C, D, and B-12, folate, biotin, calcium, iron, and 2 digestive-support blends. In addition, you’ll find Omega-3 fatty acids like DHA and EPA to help with healthy brain development. 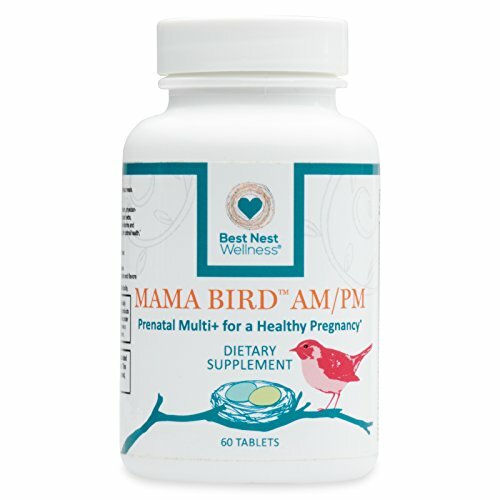 These prenatal vitamins are a great choice for women looking for a great all-around product. It provides you with all the essential nutrients you need to stay healthy, but also some that can help boost your baby’s development. You can find these prenatal vitamins in only one size-option, and each bottle will only last you a month. You must take these standard pills 4 times each day, which is much more than other options on the list. Luckily, you can try blending them into drinks, breaking them in half, and taking them throughout the day if taking 4 at one time is too much. Baby & Me vitamins use special ingredients like organic ginger to support mothers’ strength, mood, nausea, and even balance. It has all the essential ingredients, plus folate, calcium, iron, and a nurturing prenatal blend. They are also packed with real foods like brown rice and broccoli that help with lactation and healthy development. Megafood’s vitamins are certified non-GMO, gluten-free, vegetarian, soy-free, dairy/lactose-free, and farm fresh. For those of you who have an issue taking pills, this product may not be the right choice. For those of you with sensitive tummies, this gentle blend is great for digestion. Most people recognize and trust the One-A-Day brand, and it’s easy to see why. They provide pregnant women with some of the most reliable vitamins on the market. You can find them in multiple size options, which allows you to stock up for months. They come as soft-gel capsules that are easy to swallow and should be taken only once a day. These vitamins contain all the essentials like Vitamins A, B-12, D, and E, iron, folic acid, and calcium. One-A-Day also includes Niacin, DHA, and a slew of other great vitamins and minerals. They can be taken before pregnancy, during, and after for an overall health-wellness. All of these nutrients support fetal development and helps keep you feeling your best. There are absolutely no artificial flavors or sweeteners, no gluten, and no dairy. It’s great for people who have allergies and has become the number-one-recommended brand by obstetricians and pharmacists. 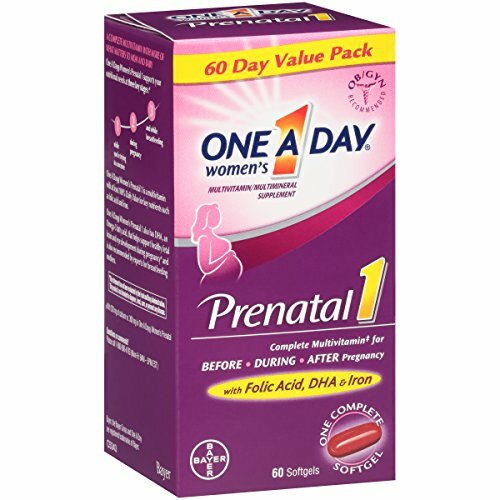 When you buy One-A-Day prenatal vitamins, you know you’re getting reliability and performance. You can purchase these prenatal vitamins in a bottle of 60 veggie capsules. Since they should be taken twice each day, the bottle should last you a month. They are wonderful for taking before, during, and after pregnancy. NutriVital loaded these supplements with all the essential vitamins and minerals, and also additional nutrients to support the growth of your baby. The company added in ingredients like chamomile and red raspberry leaf to calm your belly and nerves. They also added in blessed thistle for uterine health and fenugreek extract for lactation. You can find Vitamins A, C, D, E, and B-12, plus calcium, iron, folic acid, and biotin. The non-GMO capsules are manufactured at a FDA-registered facility, so you know you will be getting high-quality products. These prenatal vitamins are completely allergen-free, so there’s no nuts, dairy, gluten, eggs, or nuts. They are gentle enough for any woman, but powerful enough to keep your health at tip-top shape. Not only will your mood brighten, but your baby will be receiving all the necessary components to grow strong and healthy. 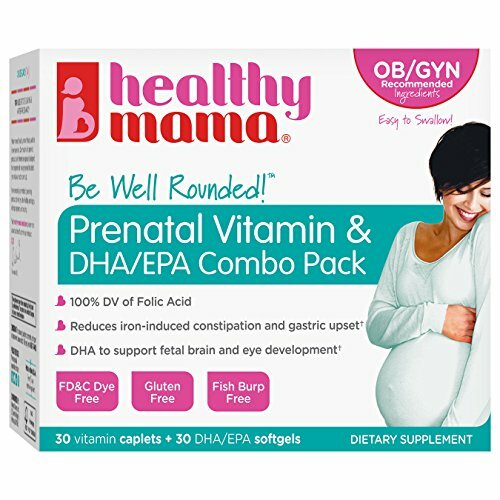 Gluten- and GMO-free, this set of supplements is ideal for expecting mothers looking for a morning-sickness cure. It can be purchased in only one size, which will last you about 4 months. Only 1 pill needs to be taken daily, but these standard tablets should be taken with food. The ingredients are carefully crafted to give you the optimum amount of nutrition during pregnancy and nursing. 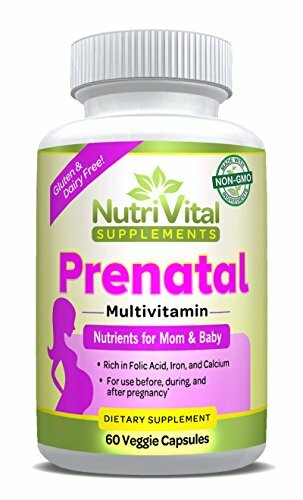 Included in these prenatal vitamins is 25mg of probiotics and enzymes that help reduce the risk of digestive issues and preeclampsia, and also fights against depression. You’ll find all the basics, like Vitamins A, C, D, and B-12. These vitamins also contain calcium, iron, and folic acid, which helps strengthen the development of baby. 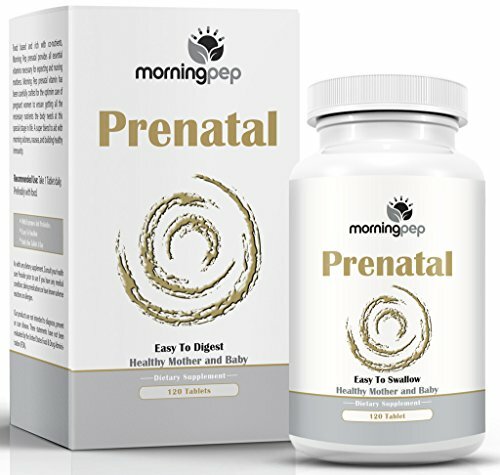 These Morning Pep supplements help support a healthy pregnancy, but breast- and hormonal-health as well. Not only do they come in a bottle-size that will keep you supplied for quite some time, but they offer all the same benefits at an affordable price. These easy-to-swallow set of pills are recommended by gynecologists all over the country. The box is made of 2, separately-designed pills: one vitamin caplet and one soft-gel capsule. Each of these pills should be taken daily (2 pills total each day), so the combo should last around a month. Taking these 2 separate pills not only distributes strength for digestive-ease, but also gives you added potency. The vitamin caplets offer all the essential vitamins and nutrients you and baby need, like Vitamins A, B, and D, plus folic acid, calcium, and iron. These include a gentle-blend formula that works against upsetting your stomach and digestive tract. There are absolutely no dyes, sugar, or gluten, so most women can use it safely. The second, soft-gel capsule contains DHA/EPA. DHA helps promote healthy eye and brain development in your baby. Specially designed to offer you the best benefits throughout the day, this 2-step system is gentle and powerful enough to keep mom and baby healthy for months to come.